I just got this game a couple days ago, and needless to say I am far from disappointed. This isn’t just a game, it’s a visual experience. I am a big fan of adventure genres, but I’m not too fond of gun-play. A friend suggested Mirror’s Edge explaining that it’s a momentum driven game based on the urban sport Parkour and it can be completed with very little shooting. Played in a unique first person perspective, you run through the city leaping, sliding, and climbing while being guided by color. The environments are stunning. Everything is crisp and engaging and because of the perspective you really take notice of the detail in textures. You don’t have to be an architect to appreciate the effort that went into making the buildings’ exteriors and interiors. Mirror’s edge is very different from so many games out there (which I think makes it appealing). However, it’s because of those distinctive features that many important people had doubts about it succeeding. What! No major weaponry, shoot-outs, or car chases! Fortunately, the creators at DICE (Digital Illusions Creative Entertainment) stuck to “their guns” and their core ideas. They studied all the physical movements and focused on creating game play that is believable. 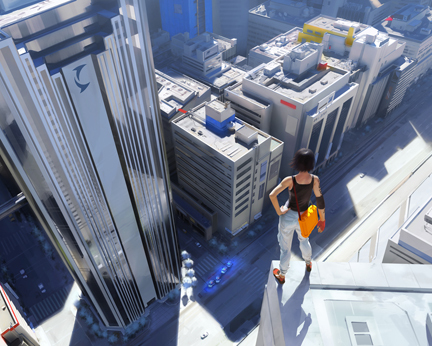 You can read about their journey and see sketches and video of their process here in Making Mirror’s Edge: Behind the Scenes at Dice written by Matt Leone. Below is the game trailer for Mirror’s Edge. Remember when the purple crayon was actually called purple, instead of the technically correct violet? I do! I am a big fan of crayons (especially Crayola). To me they are your first introduction into the world of art and helps spark your creativity. You learn control coloring in the lines or can just color with complete abandon. Every page was a masterpiece and now that you’re all grown up those same pages give you something to smile about. Actually I laugh, my color combinations at the age of 4 were priceless. Check out this COLOURlovers article on All 120 Crayon Names, Color Codes and Fun Facts. By the way, COLOURlovers™ is a site that keeps track of color trends and has real world examples, patterns, and a large active community. It is a tool for fashion designers, artists, architects, and basically anyone who uses color in their daily life. If you would like to know even more about Crayola Crayons check out the Crayola® Crayon Chronology.